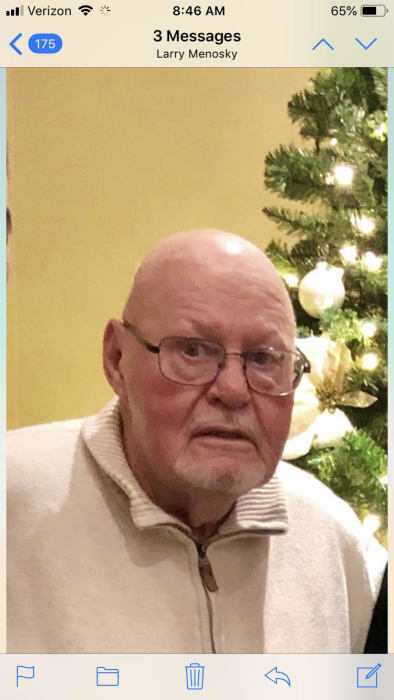 CANFIELD – A Mass of Christian Burial will be held on Tuesday, April 2, at 11 a.m. at Holy Apostle Parish, St. Stephen Of Hungary Church, 854 Wilson Ave. in Youngstown, for Mr. Lawrence A. Menosky Sr., who died Friday afternoon at The Cleveland Clinic. Larry was born Aug. 26,1934, in Erie, Pa., a son of John and Catherine Hopko Menosky. He was a 1953 graduate of Woodrow Wilson High School, received his Bachelor of Education Degree from Youngstown College and his Master’s of Education from Westminster. Larry was a U.S. Army veteran and had taught in the Warren City Elementary Schools for over 30 years. He was a member of the church, its Holy Name Society, Past President of the St. Vincent De Paul Society St. Stephen Of Hungary Conference, a Lector, Eucharist Minister and a past member of the Liturgy Committee, all at the church . Larry married the former Geraldine Lenton on April 18, 1964. He leaves his wife, Geraldine; three sons, Larry II (Tiffany) Menosky of Madison, Ohio; Christopher (Andrea) Menosky of Boardman, and Martin (Christine) Menosky of Logan, Ohio; two sisters, Marilyn (Gene) Spatholt of South Carolina and Charmine Macinga of Struthers; one brother, Bob (Kriss) Menosky of Riverside, California. and seven grandchildren, Peyton, Caitlin, Connor, Addison, Caroline, Logan and Clayton Menosky. Larry was preceded in death by his parents, and his two brothers, Richard and John Menosky. Larry’s family would like to thank Dr. Nino Rubino, The Cleveland Clinic and its Neurological ICU staff and Hospice for all of their care and compassion given to him and his family. Family and friends may call on Tuesday from 9 to 10:45 a.m. at the church, prior to the service at 11 a.m.
Memorial contributions may be made to Our Community Kitchen c/o Skip Barrone 551 Mahoning Ave. Youngstown, OH 44502 in memory of Larry.